Mocean Worker – Candygram For Mowo! Four years after his LP entitled Cinco de Mowo!, the one man big band is back with a fresh, tightly produced material, which can get you in a party mood in no time. For those who haven’t heard about the work of Mocean Worker yet, it’s enough to take a look at the Philadelphian producer’s biography. The drum’n’bass DJ-turned-bassist, who got to hang around the greatest jazz musicians when growing up (yes, by the „greatest” I mean names like Miles Davis or Luther Vandross) incorporates all the elements he brought from his diverse musical background into his work . If, after having read all this, you’re expecting an ecletic, jazzy madness from Mowo, then his latest album won’t disappoint. When hearing the first bars of the opening track, Shooby Shooby Do Ya, which takes us straight back to the 1930’s big band era, the first thing that came to my mind was cartoons. (Apparently, I’m not alone with this: Czarek Kwaśny, polish animator who made the amazing little cartoon for Mowo’s Shake Ya Boogie, now also made an animation for Shooby Shooby Do Ya.) For me, listening to this album as a whole or even only a track or two of it is like getting lost in a lovely vintage cartoon, where every person is a strange character and the bulidings are never straight. And this is something that can really make those grey Monday mornings fun. 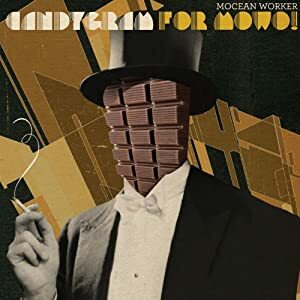 As Mowo puts a little gospel, swing, soul, some house and of course hip-hop in this tasty cocktail that is his album Candygram For Mowo!, the listening experience is a bit like jumping to different eras of the past, while constantly getting back to the present. One of the album’s highlights definitely has to be My Own Little World featuring funk-soul sensation MC, Lyrics Born, whose flowing voice matches the beat so perfectly that it becomes an intrument. I could easily imagine Swagger with its uplifting beat as a movie soundtrack, specifically for a scene where one of the characters makes a memorable entrance. Therefore it’s not wonder that Mocean Worker’s music was used in several movies (check Tres Tres Chic in The Pink Panther, Chick a Boom Boom in 13 Going on 30 or I’ll Take The Woods and Float in the documentary Who Killed the Electric Car?). Even though iTunes classifies this album as „Electro Swing”, I believe it’s much more than that: it’s modern jazz at its finest. And Mowo deserves all the candygrams for such a delicious piece of art.